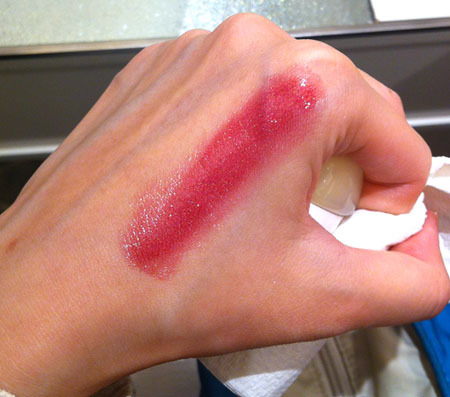 The Le Metier de Beaute Empress lip kaleidoscope has arrived at Bergdorf's and like a child playing with a long awaited gift for the first time I greedily swiped it over the back of my hand (I apologize for not getting pictures of the kit itself). This is how Empress looks layered bottom to top. I can't recall the exact shades, but I think it goes from an aubergine to a mauve-pink to a blue-based red and finally, a blush-beige. I love that it adds up to this luscious plummy red. I think Empress is my favorite lip kaleidoscope of the line yet, but I can only get it in two weeks - more on why tomorrow. Le Metier de Beaute Empress retails for $95. To reserve yours today, call the Bergdorf counter at 212-872-8612! That is such a beautiful, unique color: I am so excited for this collection! That looks fabulous! Man I'm so jealous you get to go to the counter!